Illus. in full color. An apple pie is easy to make...if the market is open. But if the market is closed, the world becomes your grocery store. 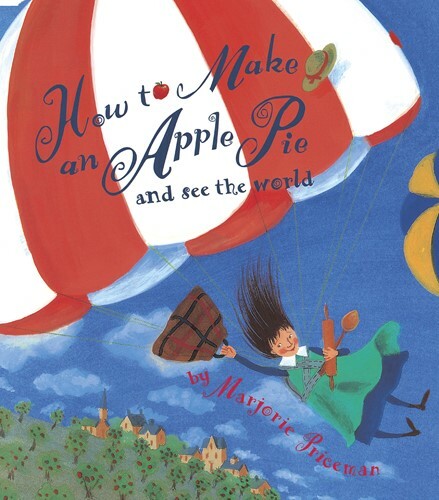 This deliciously silly recipe for apple pie takes readers around the globe to gather ingredients. First hop a steamboat to Italy for the finest semolina wheat. Then hitch a ride to England and hijack a cow for the freshest possible milk. And, oh yes! Don't forget to go apple picking in Vermont! A simple recipe for apple pie is included. "Libraries should consider purchasing multiple copies since every preschool and primary-grade teacher in town will want a copy to read." --(starred) Booklist. From the Hardcover edition.